I found this recipe on Iowa Girl Eats and am kind of obsessed with it. So obsessed I have made this for dinner 3 weeks in a row! It's just so easy, you can make it in the time it takes to brown ground meat, and it's healthy...holla! I changed it up a little by using ground turkey instead of ground chicken breast and I omitted a few ingredients based on my own likings. Simple, easy, delish, and tastes like the real thing...I have had 3 other taste testers confirm and then they ate it all up in like 2 mins...no leftovers for this one! I get about 12 wraps out of this recipe, so it's serves about 3-4 people for a light dinner (me) or an appetizer. Heat a large, non-stick skillet on high. Add ground turkey, onion, salt & pepper, and cook until turkey is nearly done, stirring often to break up the meat. Add in minced garlic and ginger, and continue cooking until turkey is no longer pink. Meanwhile, in a microwave safe bowl, combine sesame oil, soy sauce, water, peanut butter, honey, rice vinegar, chili garlic sauce and pepper. Microwave for 20 seconds, then stir until smooth. Add into the skillet and stir to combine. 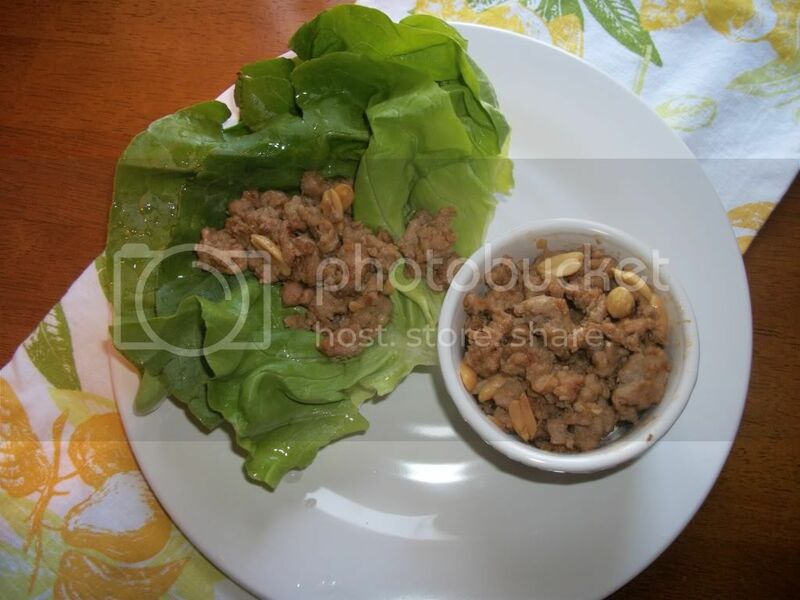 Sprinkle with chopped peanuts, and serve with cold lettuce leaves. Enjoy! Thanks for posting the recipe. This is a favorite and a must-have whenever we go to P.F. Chang's!! !